Wyatt Cenac. Photo credit Barry Wetcher/HBO. When Wyatt Cenac, the writer, comedian, and host of HBO’s Problem Areas, was a teenager, he realized that the melody for The Pharcyde’s “Passin’ Me By” was sampled from Quincy Jones’ “Summer in the City.” He went, he tells me, “down a rabbit hole,” sourcing the samples of more of his favorite songs, reading the liner notes, learning their histories, surprising himself. I’ve asked him about his adolescence and childhood, because I’m curious about how he came to be curious. The Problem Areas in his show’s title refer to large societal issues, the kind that require exploration and conversation; the sort that can’t always be solved, not immediately, but rather examined. 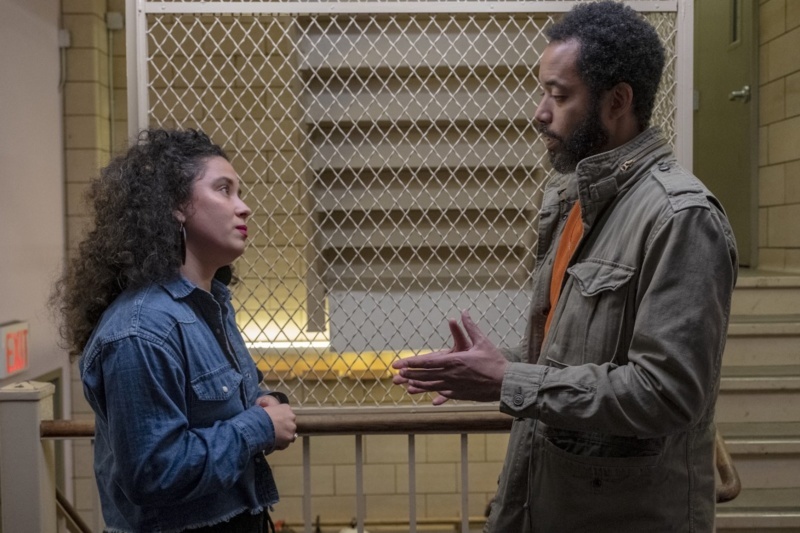 He slowly parses through one each season; last season, Cenac, a former Daily Show correspondent, discussed policing in America: training rituals, mental health issues, relentless racialized brutality. 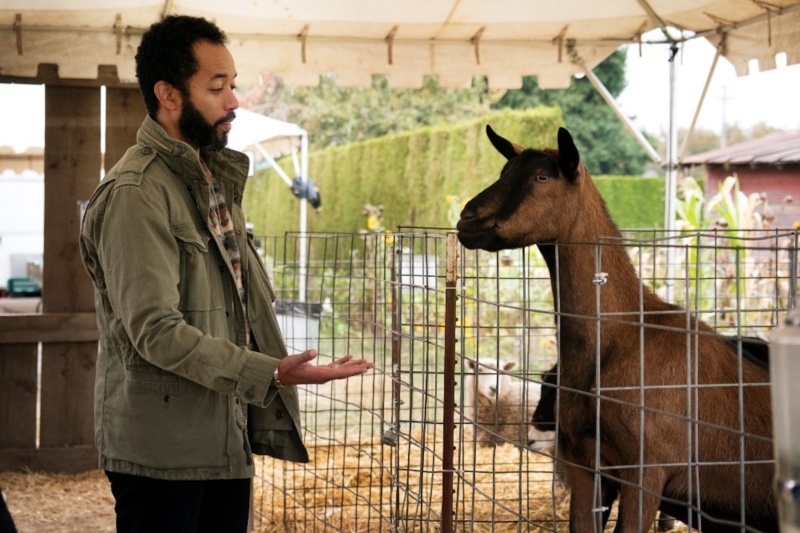 For the second season, which debuts April 5, he and his team (which includes comedian and writer Hallie Haglund, journalist Emma Carmichael, and filmmaker Ezra Edelman) will focus on education, a “problem area” at the root, he explains, of so many others: poverty, immigration, mass incarceration. Problem Areas recalls—to me, at least—education specials of the 1970s: a jazz-and-hip-hop-inflected landscape of deliberately doofy animations, Cenac’s characteristically dry and warm humor, and profoundly thoughtful interviews. Cenac passes the mic often: to students, teachers, journalists, activists, to anybody else who can get to the root of it. Unlike other late-night specials, the punchlines are few, serving only as setups to the types of conversations he hopes will provoke even more—at home, with your friends, in your community. Below, we talk about this, and more: collective responsibility, how to engender sociopolitical empathy using sports jerseys, dragons, and restorative justice. Carlina Brown Banks, Wyatt Cenac. Photo credit John P. Johnson/HBO. Ever since I started watching your standup, I wanted to know what you were like as a kid. In an interview with Impose, you said you wanted to be funny, but I wonder if you asked a lot of questions, if you were a curious child. I’m trying to think, “What was I like growing up?” I think I probably asked questions; I was curious to a degree. I wasn’t necessarily a tree-climbing kid. But I definitely wanted to understand things. I would zero in on them, pay attention to them. I can remember—as a kid, and even into my young adulthood—being interested in particular subjects and trying to figure them out. I remember the first time I heard the original song, “Summer in the City”—a Quincy Jones song—that The Pharcyde had sampled. I was in high school and really fascinated about it, thinking, “I want to find that album.” I found myself looking for it, and would start to read liner notes of other CDs I had. I did that with animation and things like that, too; I would find rabbit holes and happily wander down them. I think that’s what I like about Problem Areas. The show is thoughtful, and feels like a balm to the maddening speed of the news cycle. Is it at least partly a response to that? To a certain degree, yeah. What can be unfortunate with the news cycle is that moments happen and they wind up getting a response—whether excitement, outrage, sadness—and then they’re gone, because something else has taken their place. But we’ve never actually finished or dealt with the first thing. That, to me, feels frustrating—that we can be in a moment where we’re outraged enough to think, “Let’s deal with that—oh, nope, we don’t have time. We have a new thing to be upset by.” It feels like that’s how nothing gets accomplished—as if we’re not supposed to feel surprised when another moment like the first one comes back, because it’s a year later and nothing’s changed. We didn’t actually try to change something in policy or in society or in behavior, so these things continue to live, fester, and become worse. I started to feel like: if you live in something long enough, maybe you can build an interest that way. Think about when the podcast Serial first came out. People were just engrossed in this story, to the point that they were trying to retrace the murder scene and figure it out themselves. You had all these amateur detectives putting time and energy into something. What was fascinating about that was: that was journalism. And it got people off their couches, in the world, talking in ways that made them feel engaged, wanting to change something. Seeing that, you realize it’s possible to engage people, and it doesn’t have to be a Marvel movie. It’s really impressive. 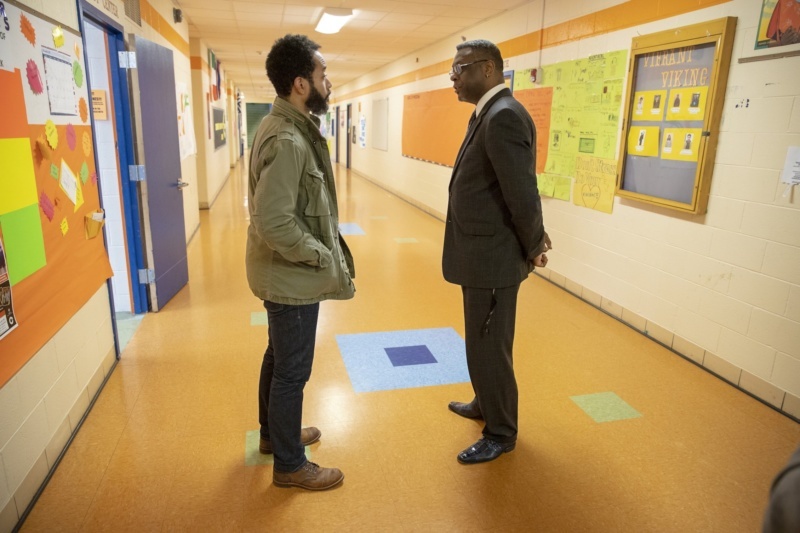 Wyatt Cenac, Principal Keith Smith. Photo credit John P. Johnson/HBO. And yet there are murders that happen every day, totally related to systemic issues. True. They just don’t have enough podcasts. We don’t have enough podcasts to keep up with the amount of murders that we’re producing in this country. Last season, you addressed police—training, mental health, racism. It was so multi-pronged. This season, it’s education. It’s something I found fascinating because we wound up talking about it in the first season. Education is such a big part of the engine that drives this society; it’s at the root of so many social issues. If you’re talking about poverty, access to quality education is one very proven way to help people get out of it. If they have access to quality education, they can have access to quality employment. If you’re talking about the dynamics that exist as far as how people interact with one another—xenophobia, racism, sexism, homophobia—education can work to create empathy and understanding for cultures that may be different from your own, for ideas that may be different from your own, for people who might be different from who you know. Education can also show you that some of those people you may be afraid of have actually existed in history, and in this country, for decades and decades. When you think the xenophobia around immigration—whether we’re talking about people coming from South and Central America, or we’re talking about immigration as it relates to Muslim immigrants—with a proper history class, people would realize: Muslims have been in this country for centuries, and have contributed to this society for a very long time. And there has always been a relationship with and labor from South and Central America that helped this country build itself in the way that it has. And there are issues in South and Central America that this country has had both a hand in exacerbating and, perhaps, a responsibility to help make better. With history, perhaps we’d be having those conversations differently. We would feel some greater responsibility to be empathetic to immigrants who want to come here—as well as to those countries, and our role in where they may be in this moment. Wyatt Cenac. Photo credit Ali Paige Goldstein/HBO. Obviously there’s a team involved in creating the show; is there any sort of personal writing process? How do you work out some of these themes? Sure. I think as we come into each season, we’ve had conversations as staff. My Executive Producer and head writer, Hallie Haglund, and I will have conversations; we’ll bring in Diane Fitzgerald, our other Executive Producer, and our writers, researchers, the field department. We’ll have those conversations and look out into the world, to see if there are people who could come talk to us and let us pick their brains. With both seasons, we’ve been very fortunate to have people come and talk to us. But when we start doing the Interrotron interviews—I can’t take credit for that word. The credit goes to Julia Sheehan, Errol Morris’ wife. It’s a device that’s known as a Pepper’s Ghost, in old carnival terms, where you reflect the image of the interviewer over the lens of the camera so that the interview subject so can see a person and speak directly to them. I’m learning a lot from talking to those subjects. We’ll usually do some before we actually start going out and shooting field pieces. As I start to piece things together, those conversations are ways for me to test the water of these ideas that I have, and to hear what they have to say. They’ve pushed me in different directions: “You’re talking about this thing and I never thought about that.” These conversations are very helpful once I start going out into the field. Once we go out into the field, the producers and researchers have done an amazing amount of work with our writers and APs to make sure we have interesting stories to tell, and that we can learn from them. What’s enjoyable, despite the stress of it—at times—is that it’s all from a place of curiosity. After meeting with everyone and learning so much from them, did you feel more optimistic? More bleak? Both? How do you feel about gathering this information? Change starts, partly, with information and getting people to talk to each other. Problem Areas can help with that. That’s a good question. I don’t know if I come out of it ever feeling more optimistic or more bleak. What always impresses me are the ways in which people are doing things. The way they’re trying to push the conversation in a different place. They may not always have a megaphone for that. I get to give those ideas a pedestal maybe they didn’t have before, because I’m on a network people tune into for dragons. Hopefully, they doze off and then wake up in the middle of an episode and say, “Okay, I’ll just keep watching this.” I hope they come for the dragons and stay because they learn about something like restorative justice. In the most idealistic vision of what the world can be, you would hope that—in the same way that anything can else have a viral moment—people will see something about restorative justice and want to talk more about that. And if it’s in the conversation more, it’s easier for it to spread, till people are saying: “How would we examine our current criminal justice system and take a different approach to it—one that changes how we view the victims, the perpetrators? As something that actually gives something back to the person or community that was harmed? What would that look like?” If people start talking about what it would look like, you’d have a bunch of people throwing their ideas out. If enough people are throwing ideas out, one of them might be good. And then they’ll do it. And then they’ll still lose. Because they’re the Knicks. Natalia Ortiz, Wyatt Cenac. Photo credit Barry Wetcher/HBO. If only people were as interested in these larger, systemic issues as they are in, say, dragons, and the Knicks. We need more jerseys for regular things. People are drawn to jerseys. I think if lawyers had to wear jerseys, maybe people will feel like, “I can root for this!” Jerseys might be the answer. Everybody wants to put on a jersey and have another person’s last name on their back, as if that person owns them. Maybe that’s the fix. All these social issues we’re trying to fix, let’s get jerseys. I don’t actually believe that, but—again—not all the ideas are great, but as long as people are throwing them out, maybe somebody else will have a better one. And by somebody else, I mean you. I threw out my idea. What’s yours? Finding ways to get Emilia Clarke to talk about these issues. But codifying it, in the show itself. Within Game of Thrones? Yes. I thought you meant, have Emilia Clarke replace me. Then, you murdered people. At a wedding. Yeah, and we gotta deal with that thing. Right now, at the very least, you and I have started some very interesting Game of Thrones fan fiction.